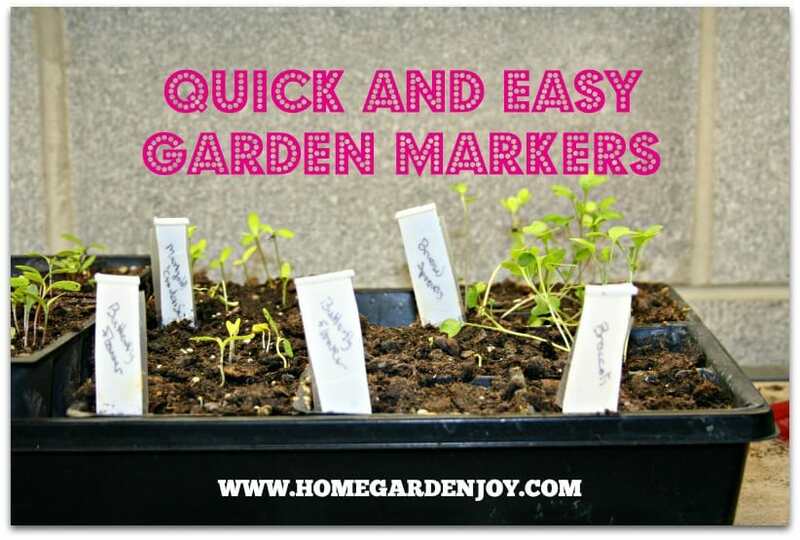 Have you seen some of the insanely creative ideas people have come up with and shared on Pinterest to make plant markers? I’ve seen rocks painted to look like books, rocks painted to look like veggies, and spoons stamped with plant names. Really, some people make their plant markers into works of art. I’m not very handy or “crafty” so I have to settle for what I know I can do…and that means focusing on 1) easy and 2) cheap, because I am, as they say, “thifty” when it comes to my gardening accessories. So without further ado, I give you my latest two plant marker projects. Gold glitters in the sunlight, making these easy to see. At least that’s what I tell myself. You’ll either think these are awesome and clever or so stupid they should have been left as rocks. My husband thinks I’m nuts, but I like the gold spray paint. 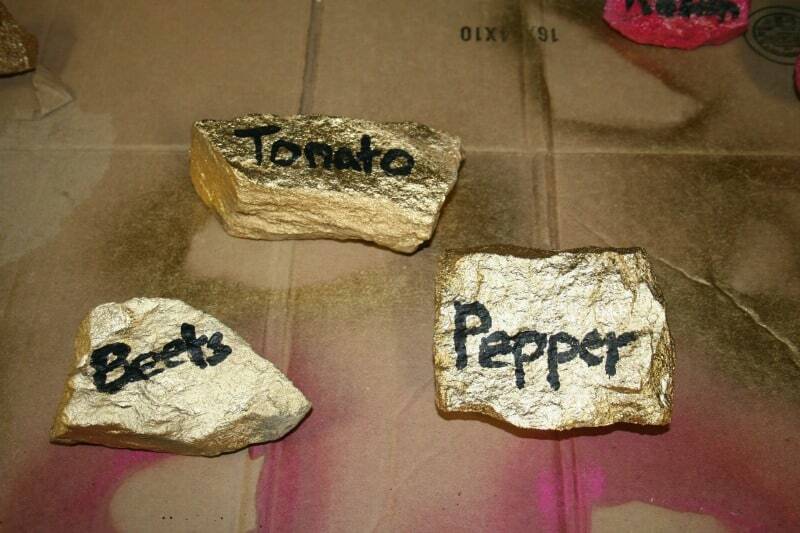 We had a few cans of it in the basement from when I spray painted a metal plant stand a few years ago, so I simply found some rocks that had a flat side, spray painted them, and used black craft paint to paint the vegetables names on them. This has to be the ugliest garden rock ever painted. 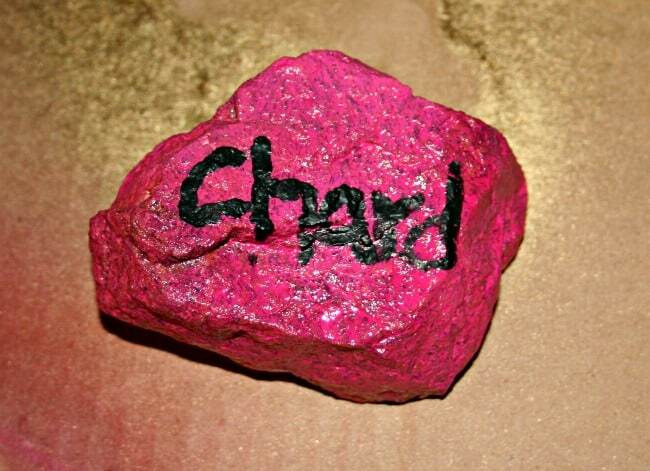 I tried using some pink paint we had in storage, too, but the rocks turned the color of Pepto-Bismol. I don’t know about you, but when I think delicious, appetizing vegetables….I don’t want to think about Pepto-Bismol, much as that particular remedy has saved my sanity on occasion. The pink rocks will be painted again. Labels made from an old frosting can and tape. If you bake cakes, you probably purchase commercial frosting. Most frosting comes in plastic cans. After cleaning the frosting cans and removing the paper labels, I use scissors to cut the bottom off, then I cut small, thin plastic strips from the can. I put a piece of Scotch Tape over the plastic, the kind of tape that has an opaque look to it (not shiny and clear.) 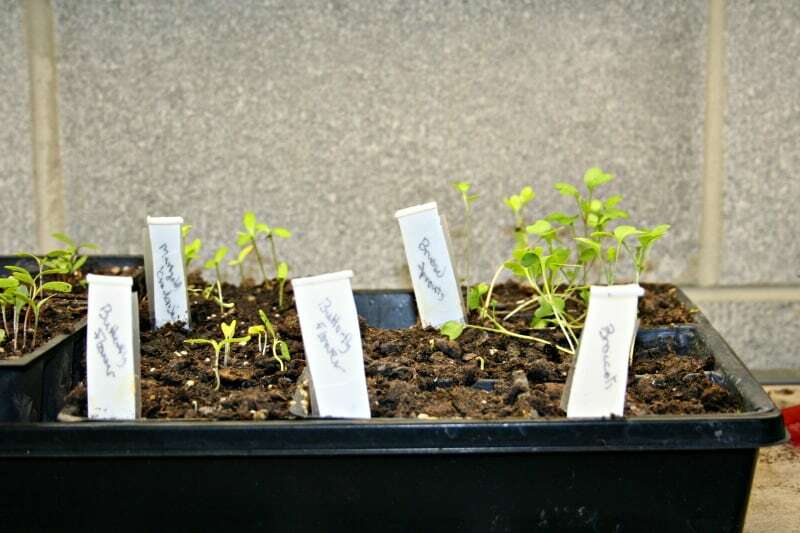 A Sharpie marker or another waterproof marker makes the plant name crisp and clear. Writing it on the tape also makes it easy to remove at the end of the growing season; just pull off the tape, clean the markers, and store them for next year. Sure, you can buy plant labels, and I have purchased them at the garden center. You can recycle Popsicle sticks. You can spend hours hand-stamping letters onto gorgeous serving spoons purchased at a garage sale, or hand-painting rocks into tomato shapes. These ideas are all wonderful, but for the “craft challenged” like me, these ideas are quick, easy and get the job done. 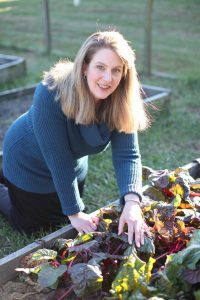 Share you ideas for plant labels here in the Comments field! I’d lose the pink one too. Kind of too much contrast from the plants. Rocks are a good idea for our wind. I favor labels made from mini-blinds, cut to any size preferred and written in pencil. The graphite lasts well, better than a grease pencil and better than a Sharpie pen. My source is the local blinds-maker. We swap. I take him some baked goods and he saves me the metal blind pieces that are trimmings or mistakes and are headed to the trash. It’s a win/win situation. Sometimes they come in colors but usually they are white or cream in color. Hard to beat. Venetian blind slats are ideal, but not many people have access to them like you do. Thanks for sharing your tip!